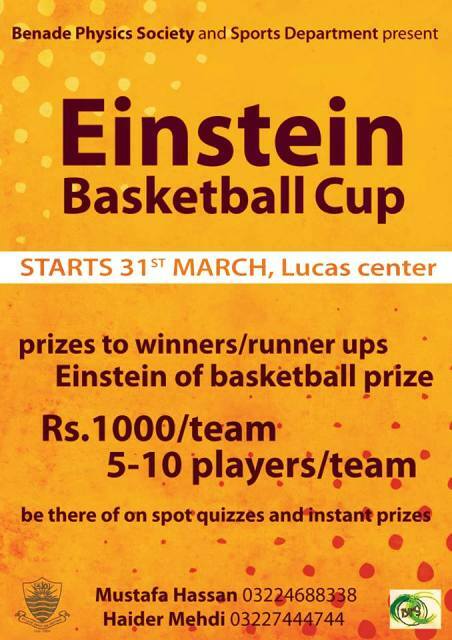 The Benade Physics Society and the Sports Department cordially invite you to “Einstein Basketball Cup”, the first ever basketball tournament to celebrate Albert Einstein. The event will take place at Lucas Centre, from 31 March to 4 April, 3:30 to 7:00 pm (schedules will be provided). All College and University students, alumni as well as faculty members are invited and can participate not only in the basketball matches but also by being a part of our quiz competitions held during the matches. The last date for registration is 31 March 2014 before 12:00 pm.